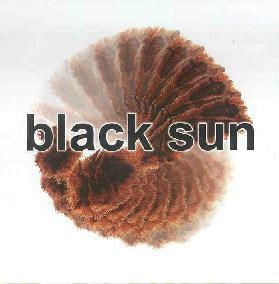 Black Sun is a project from Scotish noise/sound-art/metal artist Russell McEwan, though several of the tracks apparently are collaborations. McEwan occupies a harsh and doomily aggressive world where the listener can be crushed into a bloody pulp one moment, and then reconstituted by semi-atmospheric soundscapes the next. McEwan shows no quarter right out of the starting gate with the opening track, "Kanon Sula", which is a dense noise excursion with bashing, drifting chords and clattering percussives. What's interesting is that while it is indeed brain blistering, there's also a strange sense of melody that pervades throughout. Sure, it's slowly developing stuff, building on repetitive patterns, but McEwan does a good job of simultaneously damaging and lulling the listener. Somewhat similar, but more in the death metal soundscapes realm that characterizes the best of McEwan's work, is the closing track, "Brokn", with it's pounding percussion, stoned doom chords, and vocals that will send the bravest of souls scampering under their beds. It's this doom ‘n gloom with an oddly atmospheric edge that I liked best about Black Sun. "Trawl", "Imbecile Mongreled" and "Bruised Beef" are other highlight tracks in this mold, all being potent slabs of noise-metal with anguished demon-from-hell vocals. "Bruised Beef" is a standout that consists of a cool combination of Halloween atmospherics, a child-like melody that sounds like something from Suspiria, freaked out spooky narration and bits of McEwan's doom-metal. There really is a lot of variety here. For example, "I Am The Dust" transitions through a number of themes, from wall-of-noise hip-hop with more blood curdling vocals, to atmospheric soundscapes. "Flesh Project" features more hip-hop influences, with the track being an interesting blend of noise-scapes, electronica and dense sonics, and the drums adding color and an off-kilter groove. "Obscenity" is more of a structured rock tune, with traditional drum sounds, and a drugged out psychedelic Stoner vibe. "Dial 42837 Hater" is a bit different, being one of the most pleasantly melodic tunes of the set, consisting of piano and plodding electro-percussion and a robotic dancey groove. And "Meldy" is one of the more space atmospheric tunes on the album, with Black Sun making good use of the piano and alien effects to create their dark soundscape constructions. In summary, lots of interesting stuff here that draws on some drastically different genres. Doom-metal fans might be confused by the slowly developing soundscape and experimental aspect of the music, though I would think the noise and sound-art crowd (at least those with an appetite for sheer aggression) would find much to stimulate their senses..
For more information you can visit the Over Records web site at: http://www.over-records.com.